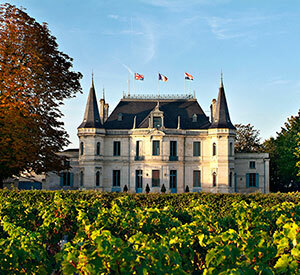 Chateau Palmer, a distinctive turreted chateau, is situated adjacent to Bordeaux's Route du Vin, located in the middle of the tiny village of Issan. Palmer is a classified third growth and is certainly the top estate of the Margaux appellation after the first growth of its namesake. Widely considered to be as profound as any of the 1st growths in its great years, recent vintages of particular note include the 1983, 1989, 2000 and 2005; however, the legendary 1961 Palmer is deemed to be one of the finest wines of the 20th century. The vineyards of Chateau Palmer are planted with 47% Cabernet Sauvignon, 47% Merlot and 6% Petit Verdot and its high percentage of Merlot accounts for Palmer's Pomerol-like silkiness and rich, red fruits character, however, the fragrance of this great Chateau's wines can only point to it being quintessential Margaux.